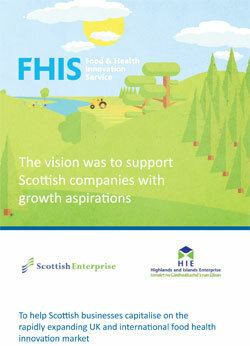 The Food & Health Innovation Service (FHIS) was established to directly support Scottish food and drink companies seeking to exploit the burgeoning market for healthy food and drink products. Scottish Enterprise and Highlands and Islands Enterprise have provided £4.2 million over five years to provide a range of practical support measures to help Scottish SMEs realise their growth potential in this marketplace. The project consortium which is led by Campden BRI, includes Scottish Agricultural Organisation Society (SAOS), Interface and Rowett Institute of Nutrition and Health. Through FHIS, to date we have helped over 430 different Scottish companies across the food and drink supply chain to reformulate existing products for health, including helping them to reduce fat, sugar and salt, exploit naturally healthy food and drink products and develop leading edge functional food and drink products. Over 20 products are now in the market place as a direct result of FHIS and a further 20 are in the pipeline. Alongside the programme of one-to-one support for companies, we ran a series of half day workshops focusing on technology aspects of new product development, including sensory science, HACCP, packaging and gluten free which have attracted 800 delegates over the four years to date. We have also contributed towards a series of materials available on the FHIS website to help companies explore their NPD options for nutrition, diet and health, including 10 NPD insights, 22 case studies, 280 technical papers, 13 videos and 23 newsletters.